War in Rival Regions is a conflict between states or independent regions, with a goal of gaining an independence or obtaining region for the attacking state. To start a war you should propose a law in parliament, which than must be voted in its favour. War will start at the moment of the law acceptance. Dictators or leaders with commander status can pass this laws instantly. There are different types of wars: ground wars, revolutions, coups, sea wars and troopers War. Any of this wars last for 24 hours. If you want to gain Levels faster, deal much higher damage and not spend your Energy drinks you should send troops in Wars or Training every hour while receiving Medals for war activity! If you have a Premium account you can select an Auto mode without Energy drinks, that way you will send troops every hour automatically. You can find the list of all active wars on Wars tab. You can see the nearest war to your region or your last war (if you dealt any damage in any active war) on Home tab. You can also notice the priority war, selected by the leader of your state in his orders in the lower part of the screen. To open war page just click on war damage points or Fight button. 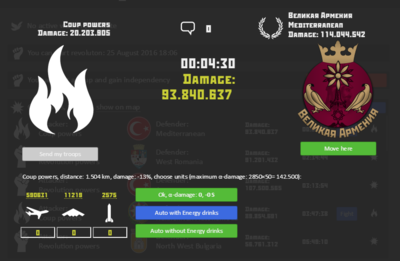 You can see in the header of any war page its type, player with the highest damage in this war, war status (time of ending) and damage per second, which can show this war importance. Active war with highest damage per second will be shown in Home tab (after level 60). To the left you will see an attacking region and its damage, to the right - defending region. Icon of laurel wreath shows which side is currently winning: the side with the highest damage. In the centre you will find a link to the comments and its count and war damage points: the difference between defending and attacking sides. For war to be won by attacking side this number should be lower than 0. In all war types each side's damage points are toped up by players: you send troops for the side you have chosen while spending your Energy. Your contributed damage will be added to the damage of other players. If you want to take part in a war you should click Send my troops button for one of the side. Than select which troops you want to send. To take part in war you should be located in an attacking or defending region or in any region of the states, that are taking part in it or in one of the state with military agreement. If these conditions are not met, you will be asked to travel to the appropriate region. Different types of weapons have different Energy costs are different damage. For different types of wars you will need appropriate weapons (see Storage for more information about weapons). The more troops you wish to send the more Energy you will need. You are limited by your current Energy points number. Your damage will be reduced if the distance between your region and region for which you fight is great. For details, see the damage formula. Ground wars can be started between two neighbouring regions. In case the attacking side wins the defending region will become a part of the attacking state, while losing a half of its buildings levels. If the defending side wins nothing will happen. Dictatorship/monarchy/one-party state will become Presidential republic in case its capital was captured in ground/troopers war. Buildings like Missile system and Airport are very important in this type of wars. For more information see damage formula. If attacking state wins the war it gets half of the cost of lost buildings (except for the Housing Fund building) in its treasury. You can find the amount of these resources on the region page (hover your mouse over Initial defend damage number). This applies to the Troopers wars too. Revolution is a war with a goal of independence. You can only start revolution in the region once every 4 days. Revolution price - 75 G for each of the 3 participants that are needed to start it. You can start revolution in Wars tab. In case of a successful revolution all 3 of the participants will get a medal. To take part in revolutions on any side you should be located in the region of revolution, military agreements don't work here. Successful revolution in any region will also transfer the state's form of government to the Parliamentary/Presidential republic. If the region has Peace time active you will be able to start a revolution in 24 hours after Peace time ends. Coups can be started in backward regions of any state with a goal to gain independence. Unlike in revolutions you don't need to be located in the coup region to start it and to take part on the attacking side. In case of a win region will no longer be a part of the state, region buildings will not lose their level (unlike in other types of wars), form of government will not change. You can start a coup on the page of any backward region. As in revolutions you need 3 participants in order to start a coup. Any player can take part on the attacking side only in one active coup at a time. There is no such limit for defending side. To take part in coup on Earth you must be located on Earth, to take part on the Moon you must be located on the Moon. All players who dealt sufficient damage (more than 5.000.000 damage points) for the attacking side will get a residency in this region. In this case they can change their residency only 5 days later. To take part in coups on the defending side you should be located in the region of coup, military agreements don't work. As in other types of wars there is a damage reduction based on the distance between your region and coup region. If you want to succeed in coup on the attacking side you should be located in or near the region, to send troops without any penalty. To start a Sea war each regions should have a sea access. Distance between these two region should not be more than 1000 km. There is a limit to the number of sea wars that can be active at the same time. 3 wars is the maximum for independent regions or states with less than 6 regions. 6 for states with 6-10 regions, 9 for states with 11-15 regions, etc. Troopers war will start in case of attacking side winning. Sea port building is very important in this type of wars. You can not start Sea war on the Moon. Troopers wars start automatically if the attacking side wins in Sea war. In case the attacking side wins the defending region will become a part of the attacking state, while losing a half of its buildings levels. Space war is the only way for a state on Earth to colonise region on the Moon. Every player can take part in any Space war with no limitations. As in Ground and Troops wars, in case the attacking side wins the defending region will become a part of the attacking state, while losing a half of its buildings levels. You should notice that you can't transfer your state capital from Moon to Earth or the other way around. If the state loses its last region on Earth and all that is left are Moon colonies this state will be broken up. You can start Space wars from any of the 20 regions on Earth with best spaceport buildings. Besides wars, where regions are at stake, there are Training wars: in any region anyone can take part in this wars, just as in real ones. You can send your troops in wars automatically: select the correct number of weapons to be sent and click Auto with or without Energy drinks. If you click Auto with Energy drinks you will automatically use them (every 10 minutes, not more frequently) and send troops. If you click on Auto without Energy drinks you will send troops every hour while not using your Energy drinks at all. Auto modes are available only with Premium accounts. After enabling Auto mode you will be able to stop it at any time. While Auto with Energy drinks is On you can not use Auto mode at work. You can, however, use Auto mode at work with Auto without Energy drinks.